When Elon Musk’s SpaceX heaved two communications satellites aloft last week, he joined a space race that’s foiled plenty of other dreamers. Billions of dollars have vanished in the quest to provide internet service from low-earth orbit. Globalstar Inc. and Iridium Communications Inc. crashed into bankruptcy but are still at it, while another effort folded despite backing from Bill Gates, Boeing Co. and others. That record hasn’t deterred almost two dozen ventures from raising money in an effort to reach broadband users, including many who are out of easy range of traditional mobile services. “Nothing has changed except the level of hysteria and the level of unrealistic expectations,” analyst Roger Rusch, president of the TelAstra Inc. consultancy in Palos Verdes, California, said in an interview. Musk’s Space Exploration Technologies Corp., Greg Wyler’s OneWeb, Boeing, and Canada’s Telesat are among the companies that have asked the Federal Communications Commission for permission to offer broadband service using satellites. But Rusch said the technical challenges are daunting. Low-earth orbit systems need complex software to run constellations of satellites, and sophisticated antennas on the ground to aim at spacecraft zooming from horizon to horizon. Costs quickly overwhelm savings from building smaller gear, Rusch said. 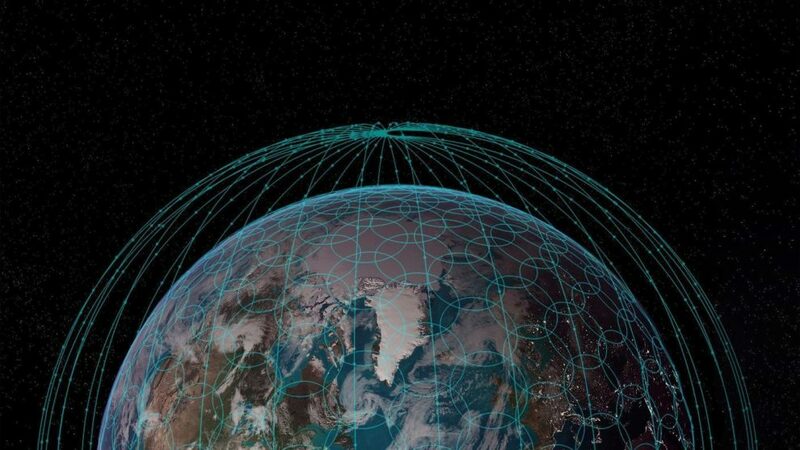 Boeing is seeking approval for 60 satellites, and the FCC last year granted OneWeb permission to serve the U.S. market using 720 satellites authorized by the U.K.
SpaceX’s plan calls for 4,425 satellites but it has also applied for another 7,518. FCC Chairman Ajit Pai has given his backing to the proposal, making it likely to win the agency’s clearance to provide broadband via low-earth orbit. The planned constellations would far exceed the current number of satellites being operated by all countries, which stood at 1,738 through August of last year, according to a tally kept by the Union of Concerned Scientists. The two satellites launched last week are tests, John Taylor, a SpaceX spokesman, said in an emailed statement. “Even if these satellites work as planned, we still have considerable technical work ahead of us to design and deploy a low-orbit satellite constellation,” Taylor said. The system would give people in less populated areas access to affordable high-speed internet service, Taylor said without providing a price. Satellites in low-earth trajectories operate 50 to 1,200 miles (80 to 2,000 kilometers) above Earth and orbit it roughly every 90 minutes. Traditional communications satellites operate much higher, at an altitude of about 22,000 miles (36,000 km) and appear to hover in one spot because their orbit takes one day, matching the Earth’s rotation. Lower satellites have an advantage in sending and receiving broadband, since signals suffer less of the lag time that can interrupt phone conversations and streaming video. As universal broadband has become a more compelling goal, appetite for service by satellites has grown, said Tom Stroup, president of the Satellite Industry Association, a trade group. Satellites have become more capable, partly by using higher frequencies that can carry more data, Tim Farrar, an analyst at TMF Associates LLC, said in an interview. Ground terminals — the antennas that track a satellite across the sky — are getting smaller and cheaper as well, he said. The starry-eyed innovators will need to compete with established satellite-service suppliers such as Iridium, which is upgrading its fleet of 66 low-earth orbit satellites using repeated launches from SpaceX. ViaSat Inc. on Feb. 27 announced broadband service from a new satellite in high orbit. “To me a business case is just not ‘does it work,’ but ‘can I make a return on my investment?’” said Rupert Pearce, chief executive officer of Inmarsat Plc., a survivor of the late 1990s satellite boom-and-bust cycle. The company supplies broadband from a 13-satellite fleet in high orbit, and has eschewed low-earth orbit, sometimes known for its acronym LEO. “We do not see a business case for these LEO networks,” Pearce said in an interview. Doing so would be “extremely challenging,” he said. The satellites themselves would need to be manufactured cheaply, difficult for products that are typically “highly bespoke, highly tailored.” They’d need to be replaced every four to five years. Then there is the operational challenge of connecting to towers on Earth, since no satellite service works indoors. LEO satellites are constantly moving; as one slips over the horizon, another would need to seamlessly connect to a consumer surfing the web, or the internet session would drop. The satellites — carried aloft along with a Spanish payload — are part of an ambitious plan that Musk outlined in remarks in 2015 as he announced an engineering campus in Redmond, Washington, near Seattle. Musk said the system would cost $10 billion to $15 billion to create — maybe more — but once developed, would bring significant revenue to SpaceX and help fund a city on Mars. Another pioneer, OneWeb’s Wyler, is working with Airbus SE to build satellites in France and Florida, and has attracted investments from Qualcomm Inc., Branson’s Virgin Group and SoftBank Group Corp., the technology giant controlled by billionaire Masayoshi Son. Satellite giant Intelsat SA plans to start offering OneWeb’s service as soon as it’s available around 2020, Bruno Fromont, senior vice president of strategy and planning at Intelsat, said in an interview. Whether that’s possible will depend on how much people can pay, said Vincent Chan, a professor at the Massachusetts Institute of Technology who studies networks. Stroup, of the Satellite Industry Association, is sure come companies will prevail.